Sometimes just eating plain old fish can get a little boring. Making fish cakes is a good way to “dress-up” fish into something more exciting and flavorful. We like experimenting with different flavor combinations to keep it interesting and fun. These little patties are easy to throw together and are good for a quick lunch or dinner. They are even great as leftovers the next day. They have a clean, fresh flavor filled with ginger, cilantro, garlic, sesame and lime. 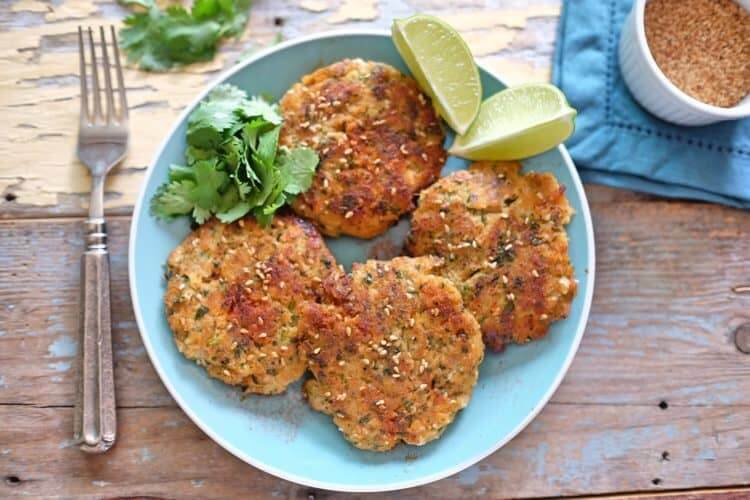 Try out these sesame ginger fish cakes the next time you are in the mood for fish for an interesting new treat. This recipe is easy, all you need to do is combine the ingredients in a food processor and blend everything up. You’ll form 6-8 patties and they will cook to a crispy golden brown cake in just a few minutes in a hot pan with some sesame oil. We love the way these cook up crispy on the outsize with a soft, flaky middle full of flavor. 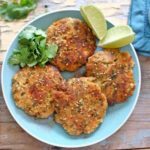 These sesame ginger fish cakes have a clean, fresh flavor filled with ginger, cilantro, garlic, sesame and lime. Try out these out for a new treat. Start by peeling the skin off of the fresh ginger and chopping it into a few chunks. Do the same with the shallot and peel the garlic also. Zest 1 lime. Throw the ginger, shallot, garlic, cilantro and lime zest into a food processor. Squeeze in the juice of the zested lime and pulse the ingredients until everything is chopped up well. Chop your fish into cubes and add it to the processor. Add in the fish sauce, 1 tbsp of the sesame seeds, paprika and arrowroot flour and pulse everything quickly until it is mixed together well and you don't have any bigger chunks of fish left. Don't process it too long, you want just a quick chop to get everything chopped and mixed. Next, form the fish mixture into medium sized patties with your hands. If it feels like there is excess moisture in the mixture squeeze it out a little while you form the patties. Heat a large skillet over medium-high heat and add in the sesame oil. Allow the pan to get good and hot before you put any of the patties in so you can get them nice and brown and crispy on the outside. Place your fish cakes in the hot skillet and sprinkle with sesame seeds. Cook just a few minutes on each side, until the fish is cooked through and the cakes are golden brown. You'll know when to flip the cakes when you see a brown crust forming at the edges and the bottom side is golden brown. Add more sesame seeds to the other side after flipping. Transfer to a paper towel lined plate to absorb any excess oil. Sprinkle with paprika and serve with lime wedges. Squeeze the lime over your fish cake prior to eating. Enjoy! So easy to make these tasty fish cakes using halibut. We decided to bake ours instead of frying, and they tasted great! Also sprinkled with black sesame seeds for a different look.